“I am not saying in this conception of adult behaviour that one style of being, one form of human existence is inevitably and in all circumstances superior to or better than another form of human existence, another style of being. What I am saying is that when one form of being is more congruent with the realities of existence, then it is the better form of living, for those realities. And what I am saying is that when one form of existence ceases to be functional for the realities of existence then some other form, either higher or lower in the hierarchy, is the better style of living. This is a brief description of the eight human developmental levels that have been defined so far. You will see evidence for the levels in personal growth, organizational development and cultural/political change. People operate out of the level where they get answers to life’s problems. Up to and including level 4, it is very difficult to see (and above all appreciate the value in) any level beyond the one you are currently at. (Reactive) An inwardly pointing worldview, dependent on outside support for its survival. Today only seen in babies and very young children, and those people suffering from a severe degenerative condition (such as Alzheimer’s) or extreme drug dependency. (Tribal) Very ‘tribal’ in its approach. The individual follows a strong leader or symbol. In today’s society it is seen in a somewhat more diluted form with some family units, football supporters, highly competitive corporate teams. Core values include safety and security. (Egocentric) A highly individualistic level, often with a lot of anger in it.Can be seen in the ‘terrible two’s’ and rebellious teenage behaviour. Also evident in macho street violence later in life. Core values here include power, immediate gratification, escaping from being controlled, being respected and avoiding shame. Some evidence that a high proportion of UK prison population is at this level shown by lack of consequence awareness. (Absolutist) A community oriented level with strong “moving away from” motivation.Strong sense of right vs. wrong, good vs. bad and the need for order in society. In cultural terms, judicial systems develop at this level. Fundamentalist religious beliefs are seen here too. Core values include justice, security and morality. Also a desire to control impulsivity and “evil” deeds. Can be seen in movements such as “right to life” and “moral majority”. (Materialist) An individualistic level with a strong personal drive and high energy operating from a “moving towards” motivation strategy. Very aspirational, keen to succeed and responds well to the trappings of success. Much of creative science emerges as a means to control human destiny at this level. Core values around success, creativity and achievement. Likes to be popular and enjoys winning. Can be seen in modern industrial nations and the upwardly mobile. (Personalistic) Focus on involvement and gaining consensus/agreement. Seeks peace with inner self and to gain contact with the inner self of others. Core values around fairness and equality with the desire to free the human spirit from exploitation. Has generated the women’s movement and the civil rights movement in the last century. Wishes to eliminate poverty, racism, chauvinism and other forms of divisiveness. (Systemic) An individually oriented ‘systems’ viewpoint. Sees the world as being in danger of collapse because of misuse of resources. Sees life as diverse and paradoxical. Has the pursuit of knowledge as a major driver but without the need to demonstrate his/her own ego. Can often see the bigger picture and be willing to take a position that is contrary to popular opinion. However, may get frustrated if others are not able to see their point. (Holistic) Sees a world in danger of geo-political collapse as a result of adopting short term strategies. Seeks spirituality and unity in living systems. Strives to eliminate war, poverty, disease, hunger and political oppression. Recognises the potential need to sacrifice self and others as may be required for the overall survival of life. Thinks and acts globally. Note: Our ability to influence each level requires both willingness and personal flexibility. It will be heavily influenced by the system or systems within which you currently sit. As Graves suggested, the more evolved levels do offer significantly more choice of action so anything you can do to move yourself, and your team, further into Level 7 thinking will be very helpful at both an individual and organisational level. 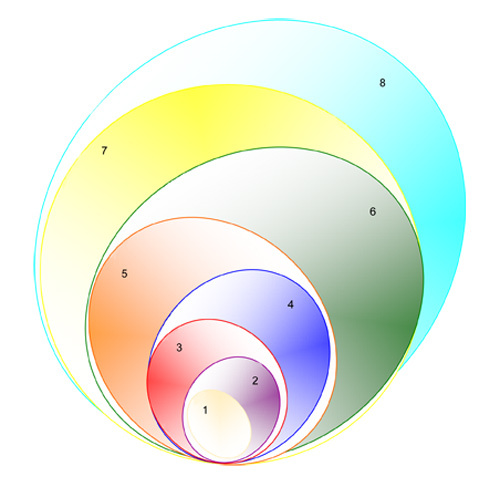 Purpose: To illustrate how each level is a ‘holon’ and is encapsulated within each subsequently emerging level. Even numbers tend towards communal orientation. No level is any more “real” than any other – it is appropriate for that person’s needs. People only move from one level to another if they cease to get answers to life’s problems at that existing level. We need to be aware that different parts of any organisation may be operating out of different levels. We need to be able to adjust our approach to enable rapport to be established with each level as appropriate. Tension, stress or some other significant change in their environment or context may cause people to regress to an earlier level. Purpose: To provide an unscientific, tongue in cheek summary of how each level may view the others, especially what they would regard as the more extreme or “unhealthy” versions of each level. Sees everybody else as “interesting” and will match them as the situation demands. No real evidence yet because of the very low numbers but should bring the pragmatic acceptance and curiosity of Yellow forward into the resolution of global problems.